With so many opportunities to watch TV or play computer games, and with so much convenience and fast food available, we don't move about as much, or eat as well as we used to. Which means many of us, including children, could end up with dangerous amounts of fat in our bodies. So it’s really important that we do something about it. By encouraging and allowing your child to have a healthy diet you will be supporting them to have better concentration skills, improved sleep and a healthier lifestyle. Prendergast School is part of the Healthy Schools Initiative which aims to promote the good health of those who work learn and play within the school. As part of the initiative it is the schools responsibility to promote healthy eating. The school provides a nutritious balanced meal as part of its school meals and this is a great option to ensure your child is having a balanced meal in the middle of their school day. 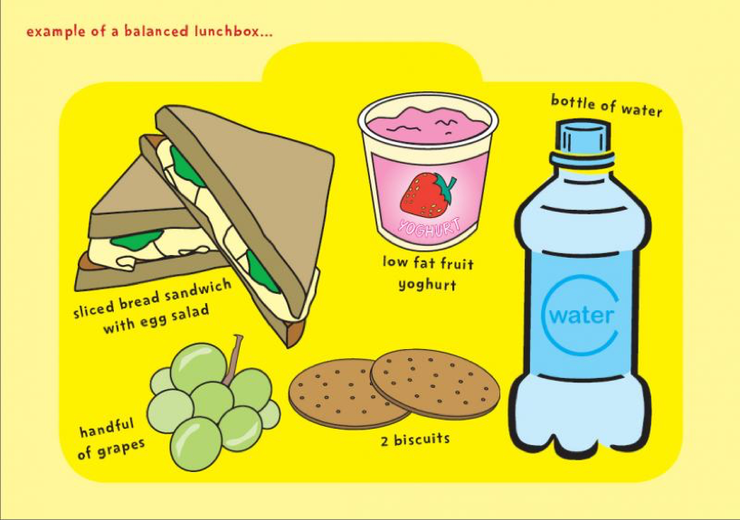 If your child prefers packed lunches there are ways in which you can help support your child to have a balanced and nutritious meal to give them the best chance of being ready for learning. Starchy food: Starchy foods are a good source of energy and the main source of a range of nutrients in our diet. As well as starch, they contain fiber, calcium, iron and B vitamins. Lunch box examples: sandwich, wraps, pitta, pastas etc. Protein: Protein foods are essential for building muscle as well as making anti bodies. Lunch box examples: chicken, lean meat, fish etc. Fruit and veg: Fruit and vegetables are a great source of vitamins and minerals as well as providing fibre to promote a healthy gut. Avoid dried fruits as a snack as these are high in sugar. Lunch box examples: apple, carrot sticks, cucumber, strawberries, cut up grapes. Something extra: a low sugar snack like yoghurt is the perfect extra snack. Something to drink: Water is the best option to ensure your child stays hydrated throughout their busy day. Plan lunches with them – take them shopping with you and let them choose their healthy options. Use the ‘Red, Amber and Green’ system that is found on food packaging to help your child decide what they should and shouldn’t be having. Educate your child on their food. Tell them about the importance of a balanced diet and the harm that can be caused by eating too much sugar and fat. Avoid processed foods. By making and preparing the lunch box items yourself you are ensuring that the added salt and sugar which is put in processed foods isn’t entering your childs diet.